Soil characteristics: Non-irrigated. Loamy textured, with a basic pH (8.60) and a low organic matter content (0.63%), making this a soil that has low sensitivity to compaction and possessing good drainage. The basic pH means that there are few trace elements essential for the vine, such as iron, manganese, boron and zinc, available for it to absorb, so it is advisable to apply these at some point by foliar application or irrigation (if carried out) during the year. Climatological characteristics: Mediterranean climate characterized by temperate winters with moderate rainfall, hot, dry summers, and autumns and springs, which are variable both in terms of temperatures and rainfall. It tends to be an area which is quite windy, which helps counter the island’s humidity. Varieties: Moscatel, Chardonnay, Syrah, Cabernet Sauvignon and Merlot. 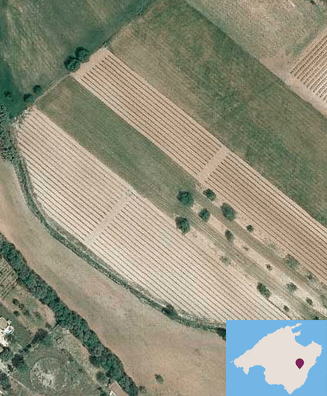 Wines produced: Golós Blanc, Chardonnay Roure, Dolç des Port, Torrent Negre, Torrent Negre –Selecció Privada Syrah- and Torrent Negre -Selecció Privada Cabernet Sauvignon-.